An Eurypterus lacustris fossil displayed at Smithsonian National Museum of Natural History (Washington DC). 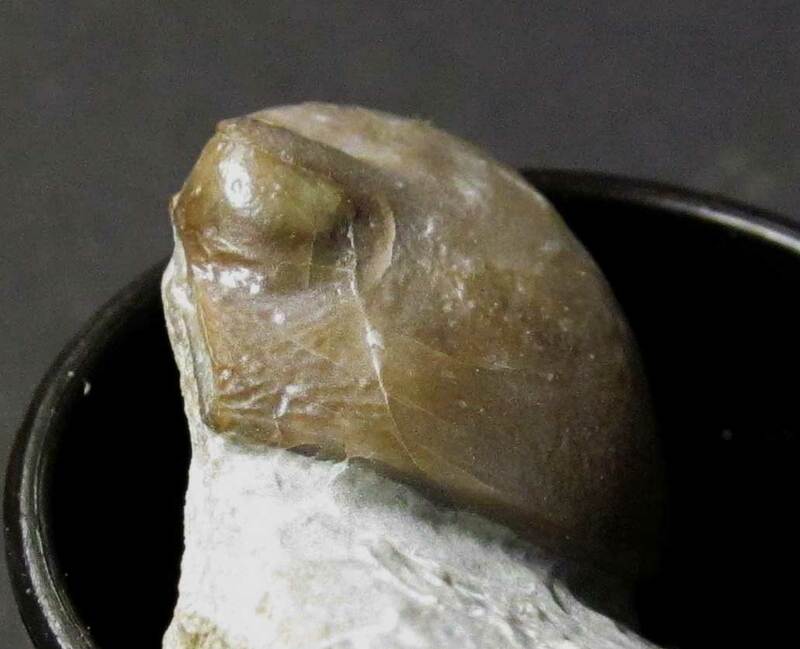 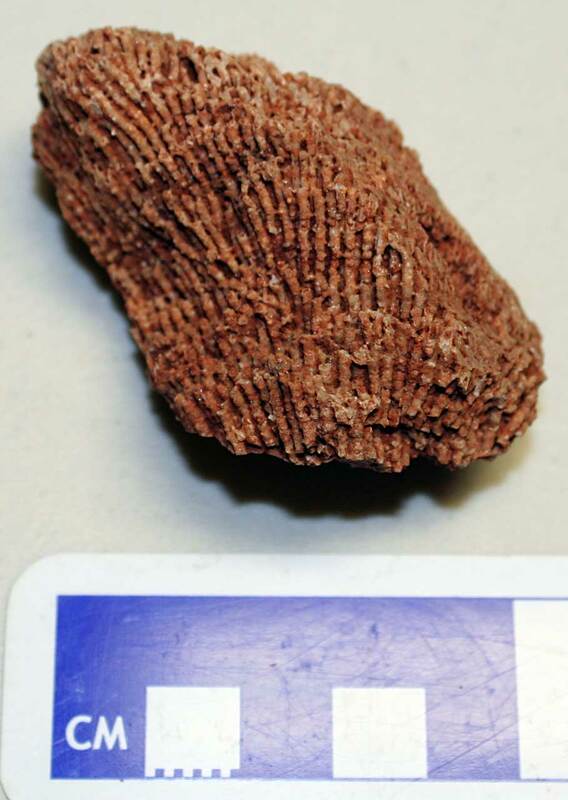 The fossil was found in New York, USA. Fossil dates to the Late Silurian Period. 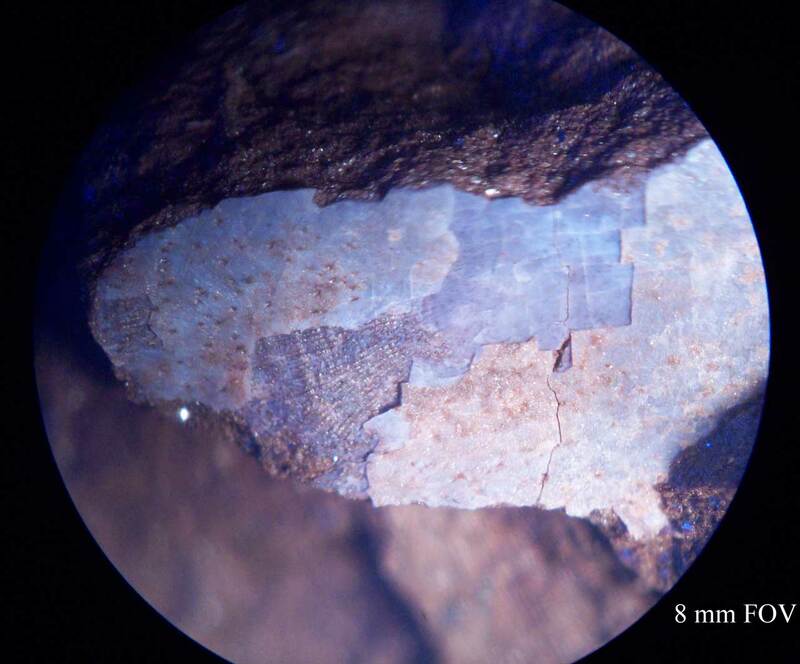 Thanks to my cousin for the photo. 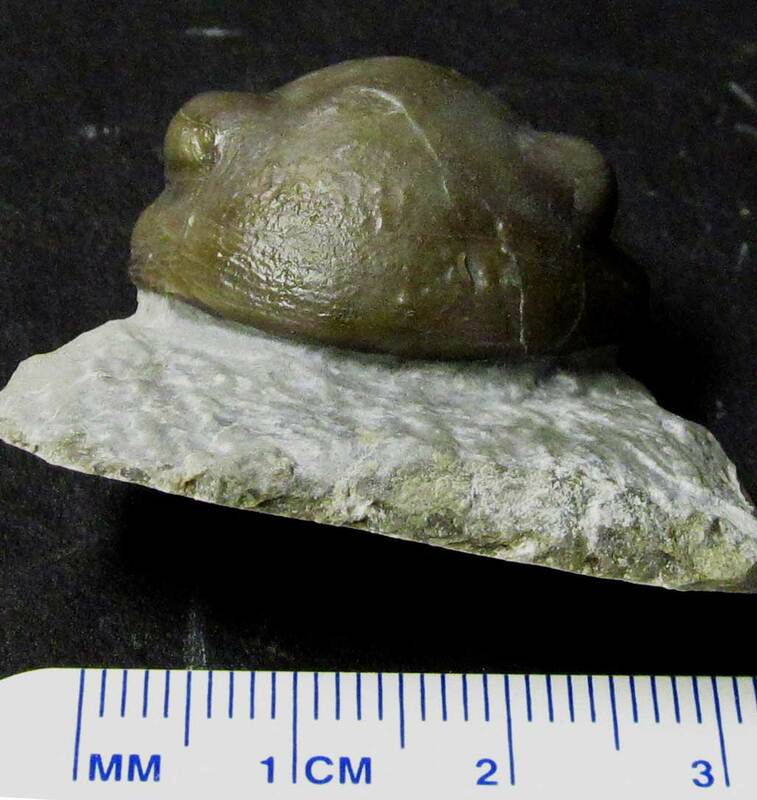 Thanks to Kenny for letting me photograph this specimen. Hexagonaria prisma coral fossil found in the Jeffersonville Limestone of Jefferson County, Kentucky, USA. 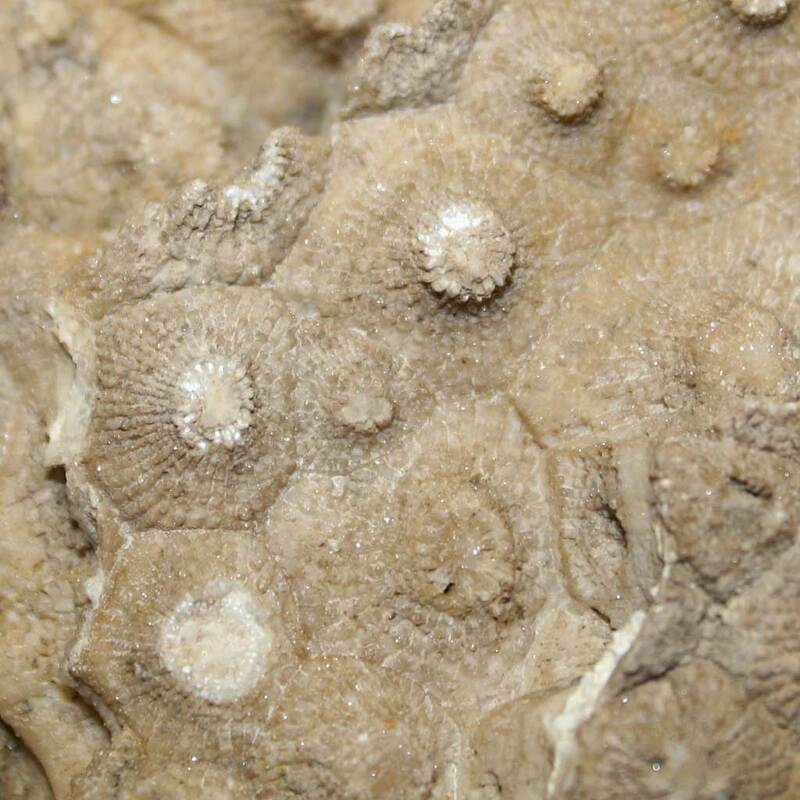 Animals existed in the Devonian Period. 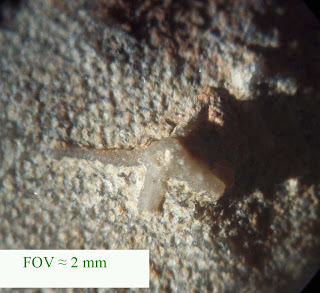 Next pictures shows how the genus got its name with the hexagon shapes contains the remains of the coral septa. 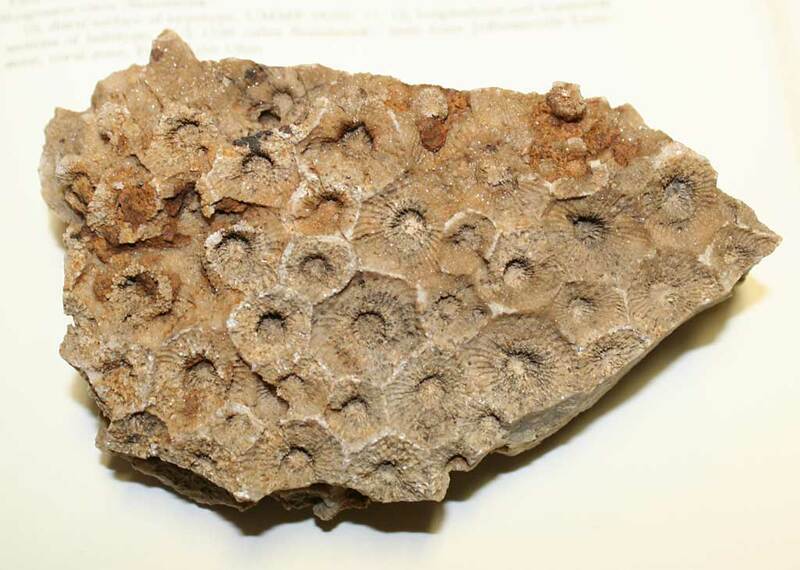 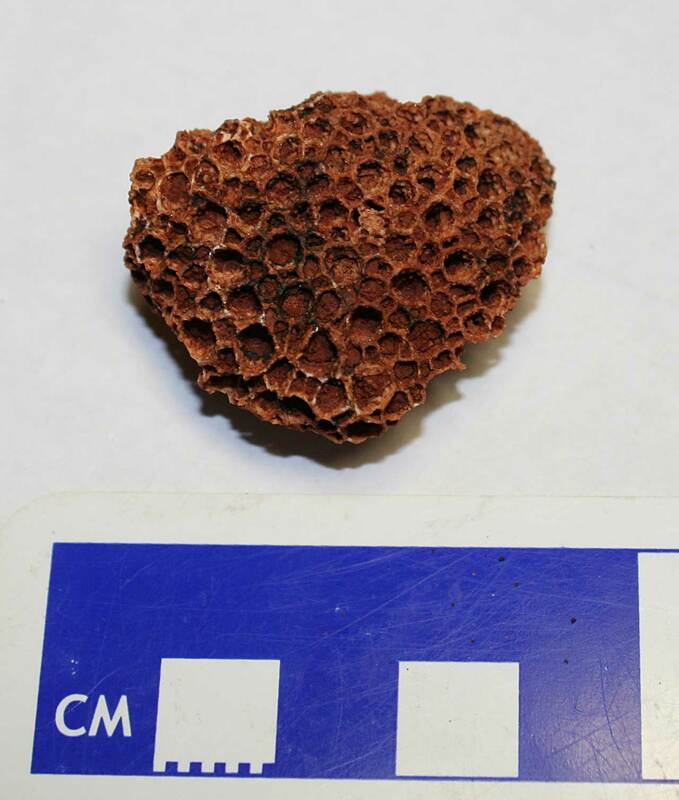 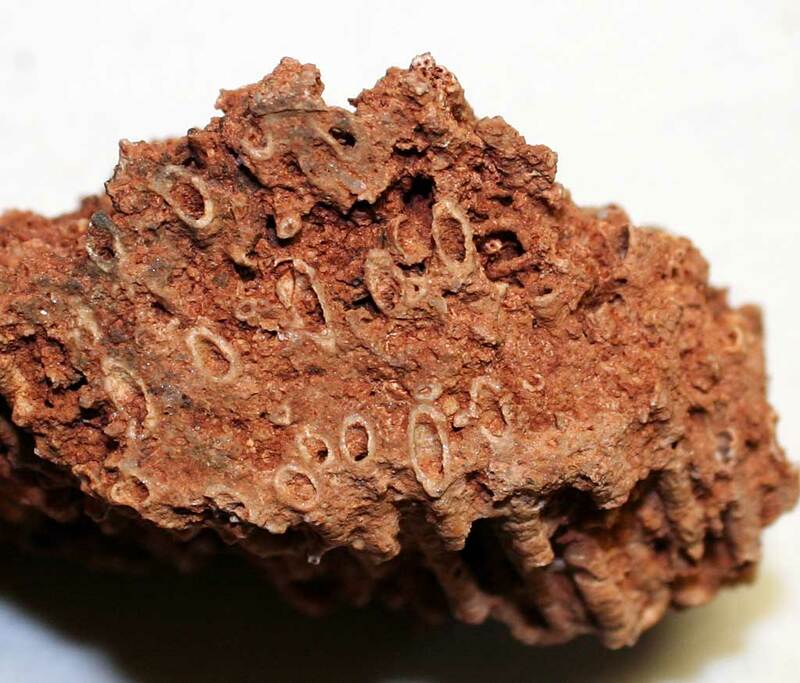 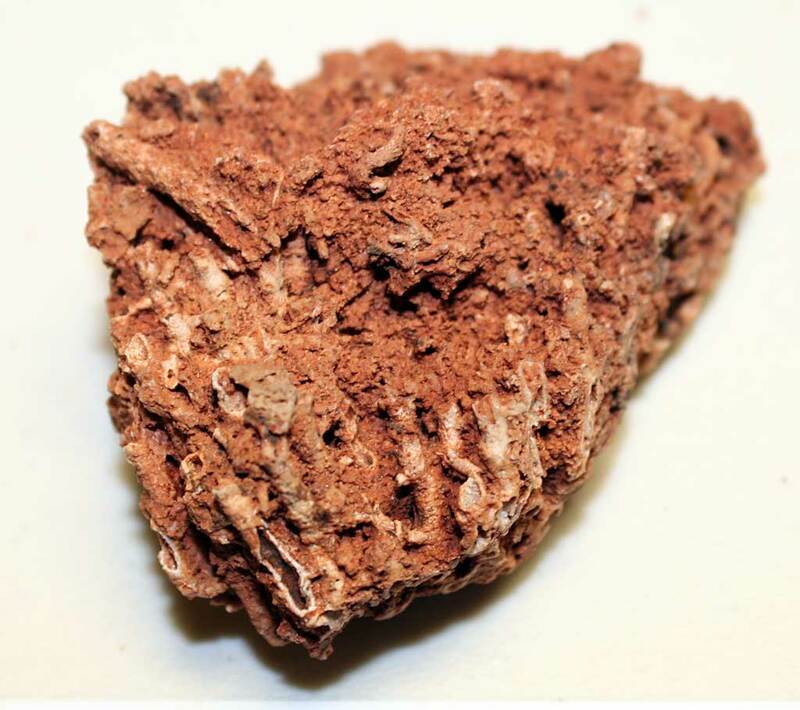 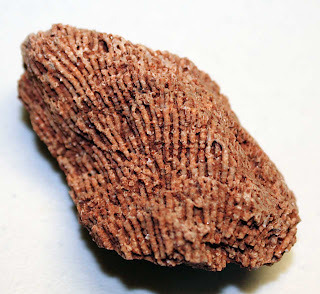 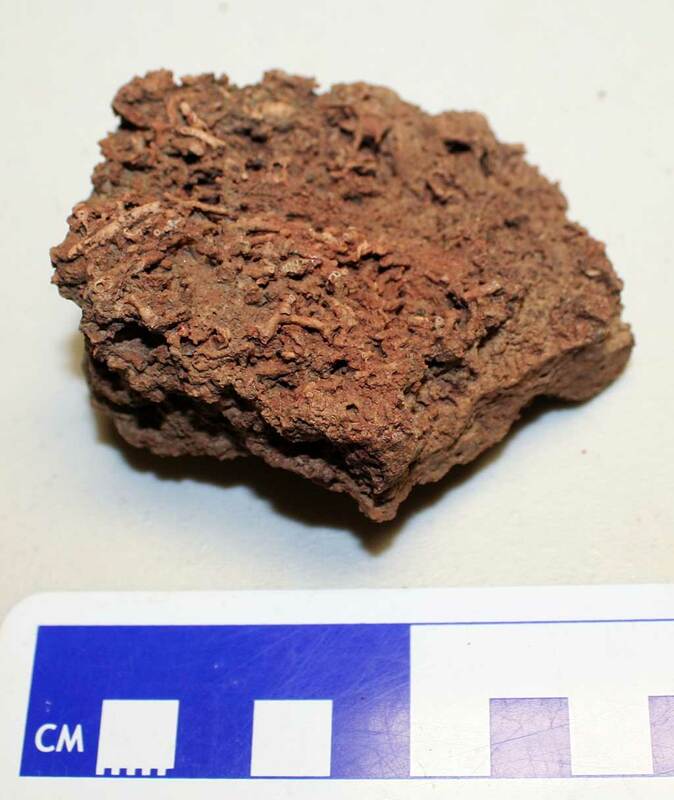 Devonian Period fossil corals can be found in the Louisville, Kentucky, USA area. This area appears to have 100s of varieties of corals. 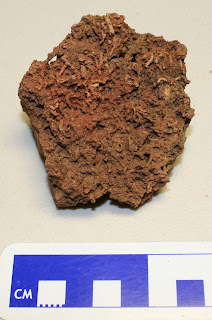 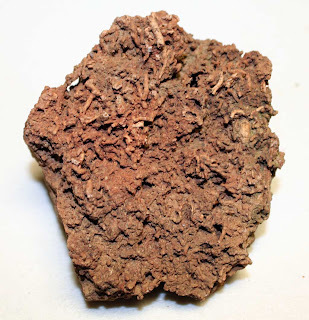 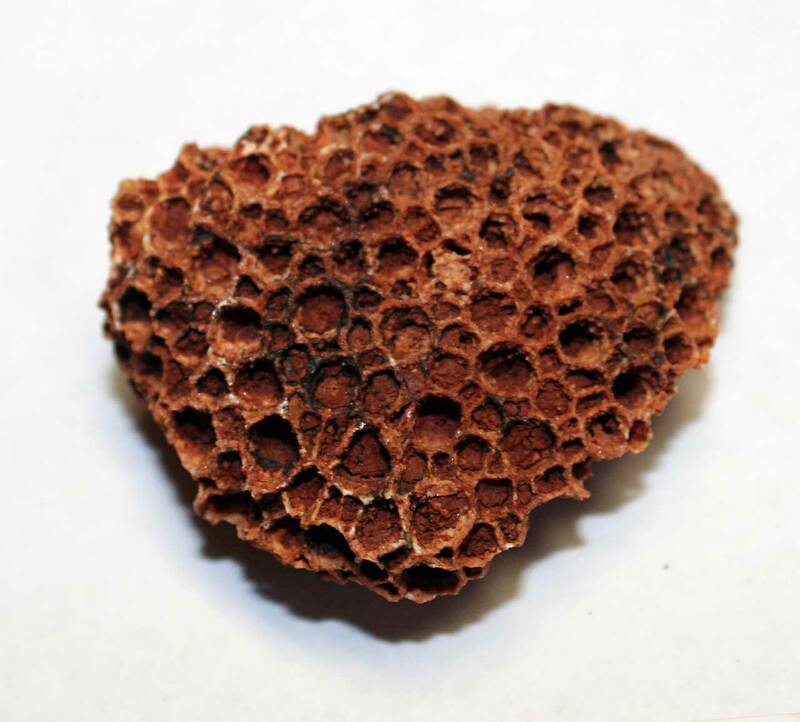 Today, the one highlighted on the blog is called Drymopora fascicularis. It is found in the Jeffersonville Limestone of Clark County, Indiana and Jefferson County, Kentucky. 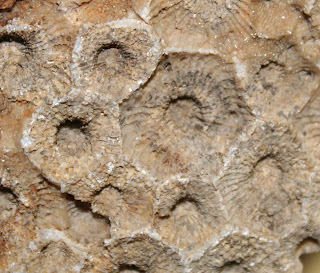 Fossil was named by Davis in 1887. Louisville Kentucky, USA is known for is wide array of Paleozoic coral fossils. The city is built upon thick limestone layers of ancient coral reefs that are exposed either naturally or during construction projects. 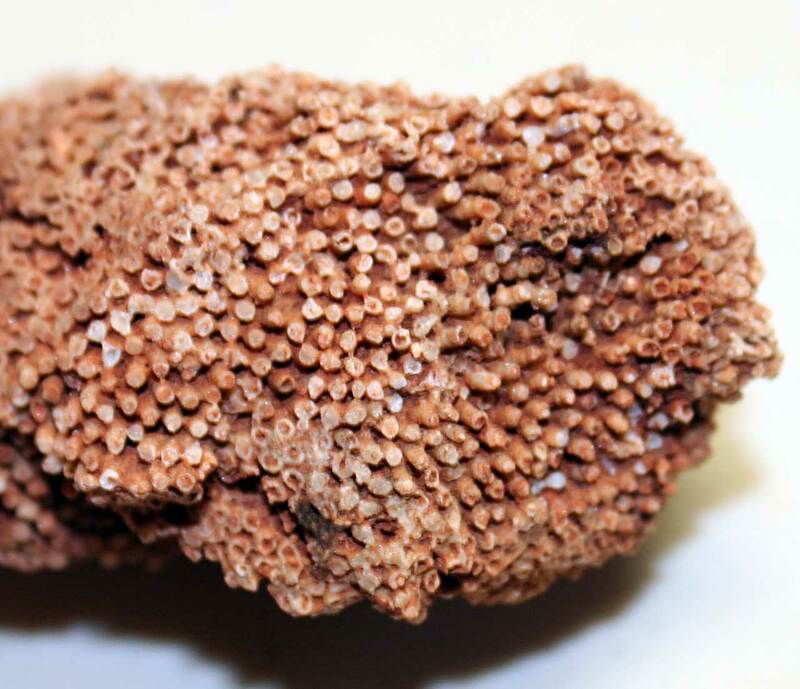 This coral fossil appears to be a Syringopora perelegans named by Billings in 1858. 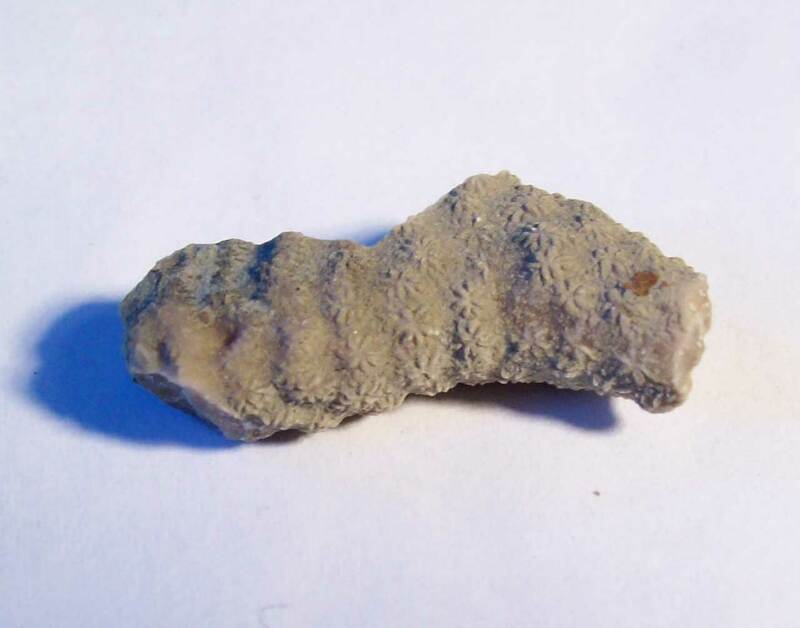 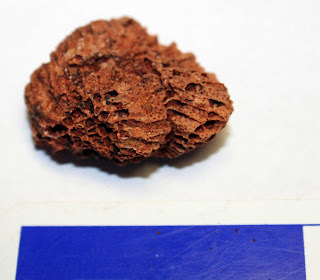 It was found in the Middle Devonian aged limestone of Jefferson County, Kentucky. This specimen is an interesting example of biodiversity layer upon layer. 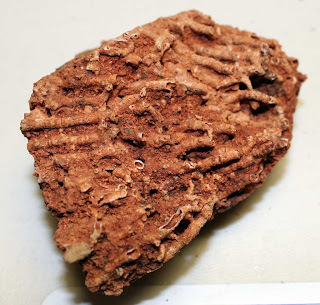 The top layer consists for at least 5 crinoid holdfast probably belonging to the Eucalyptocrinus. 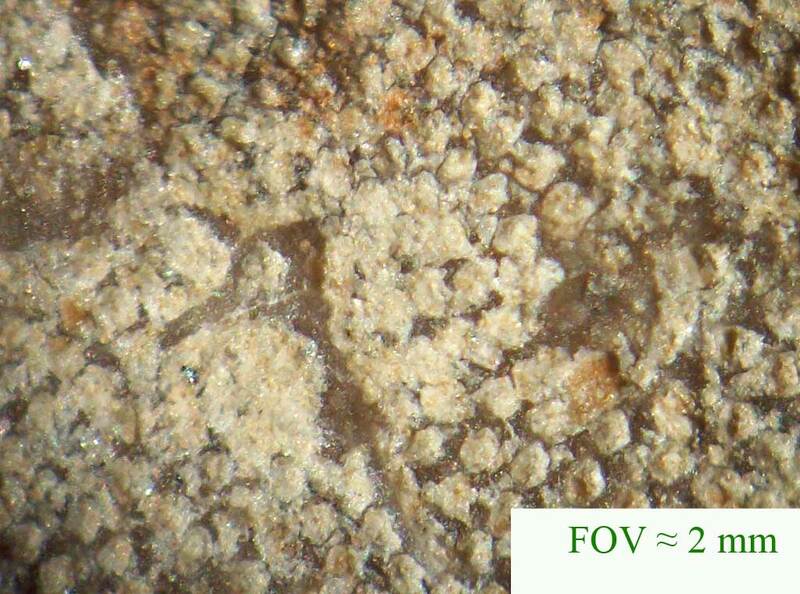 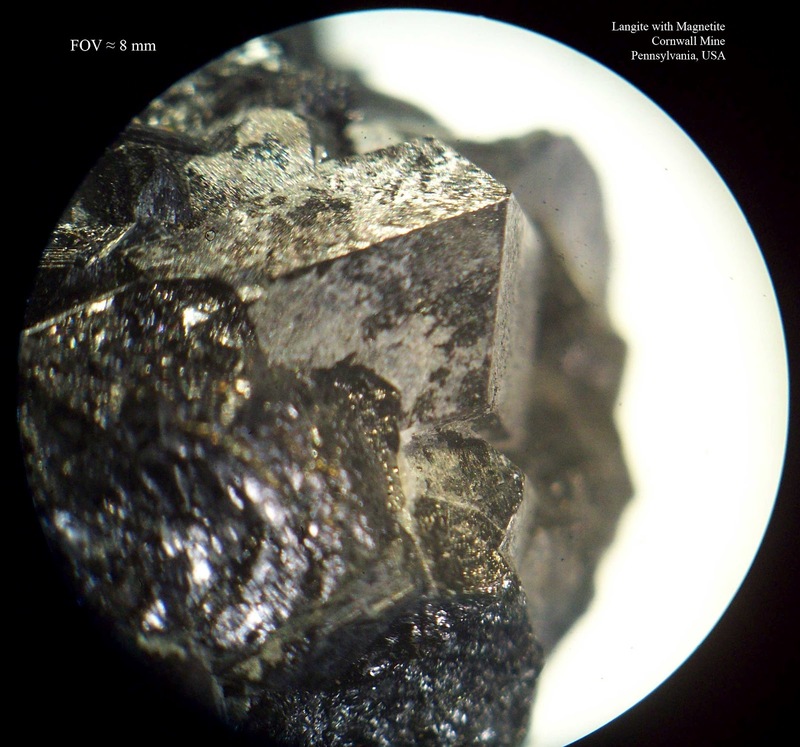 See following magnified images for more detail. 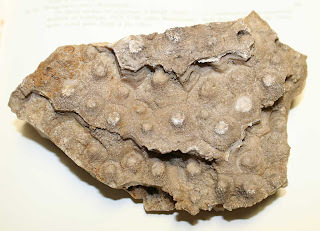 These holdfasts attached to an encrusting bryozoan that could be either Lichenalia or Sagenella. 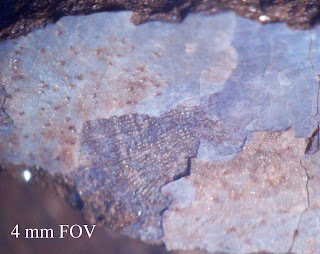 The bryozoan is covering an Eospirifer brachiopod. 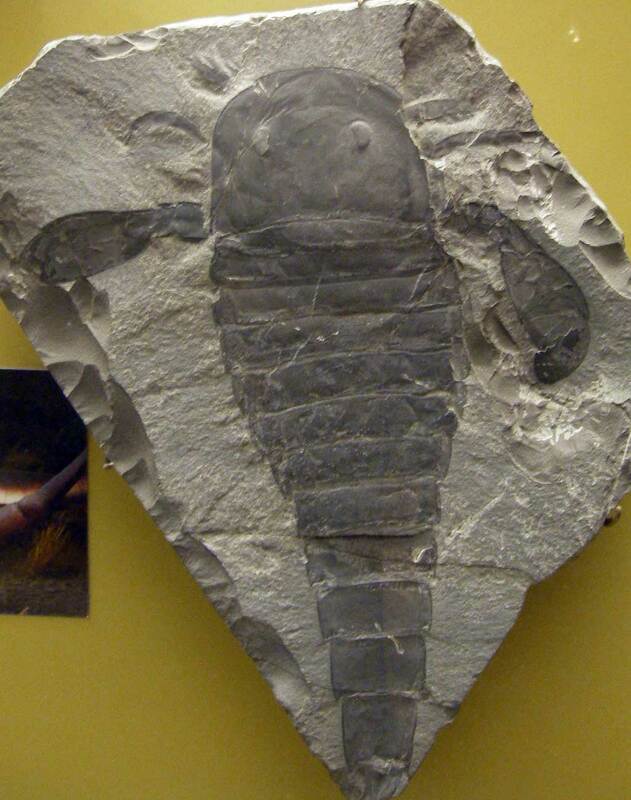 Creatures lived in the Middle Silurian Period (425-419 million years ago). 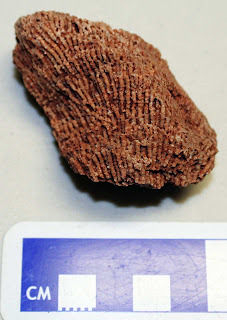 Fossil found in the Waldron Shale of Clark County, Indiana, USA. 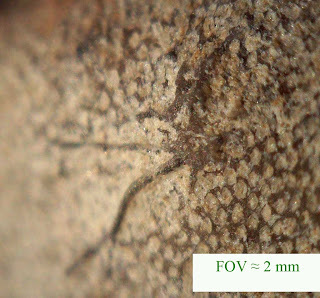 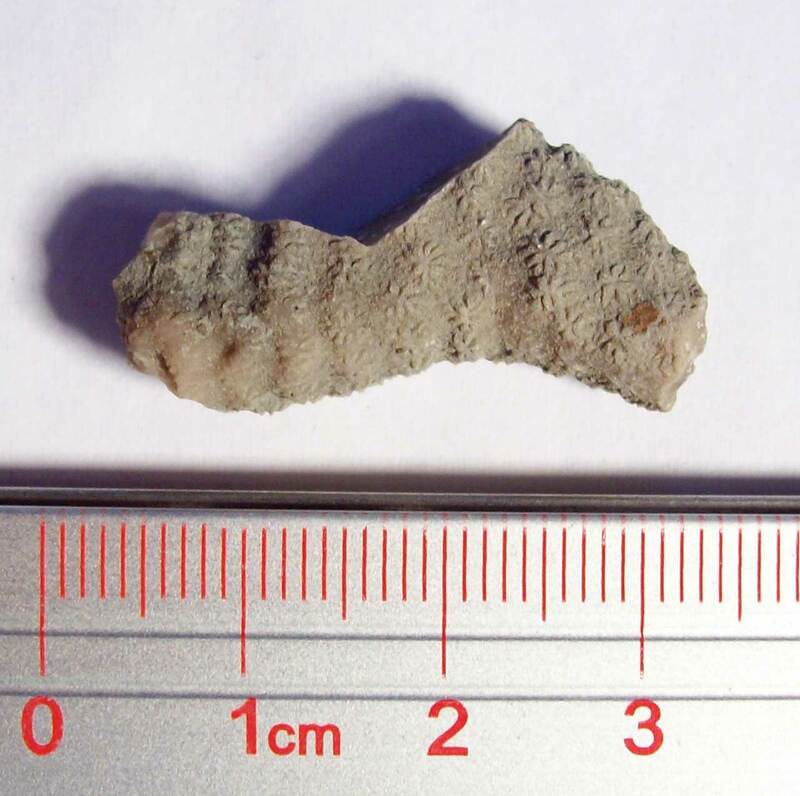 Today's fossil is an easy to identify Ordovician bryozoan fossil that looks like a star. 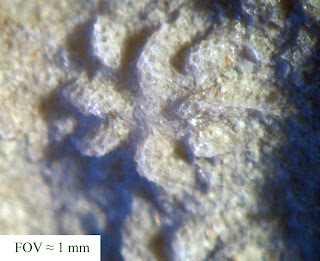 It is called the Constellaria sp. This fossil was found in the Lexington Limestone of Franklin County, Kentucky, USA. The next image is of a magnified star shape. 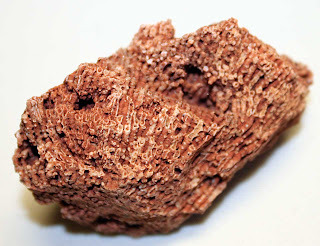 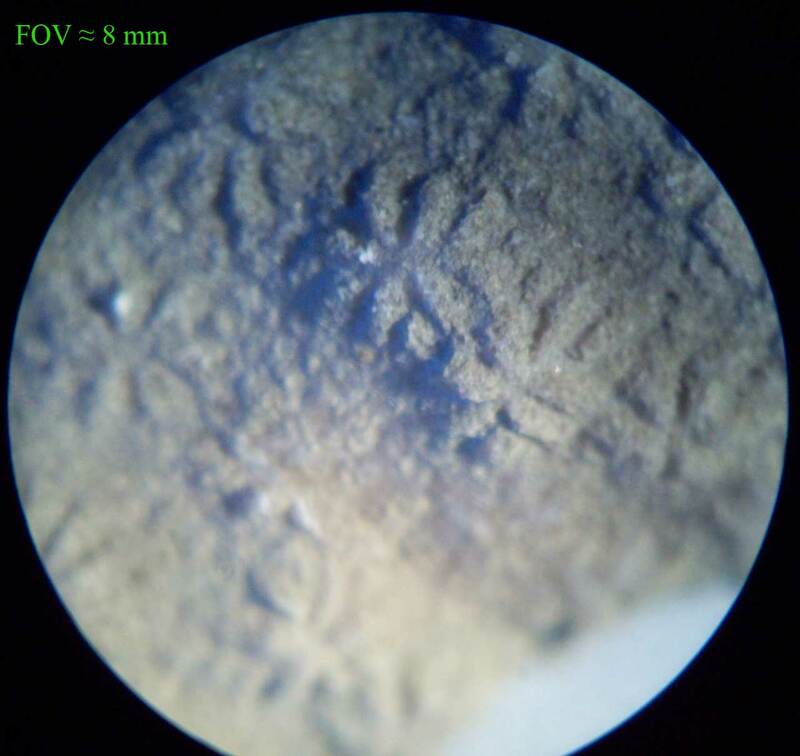 It is nice in you can see the individual pores (zooecia). 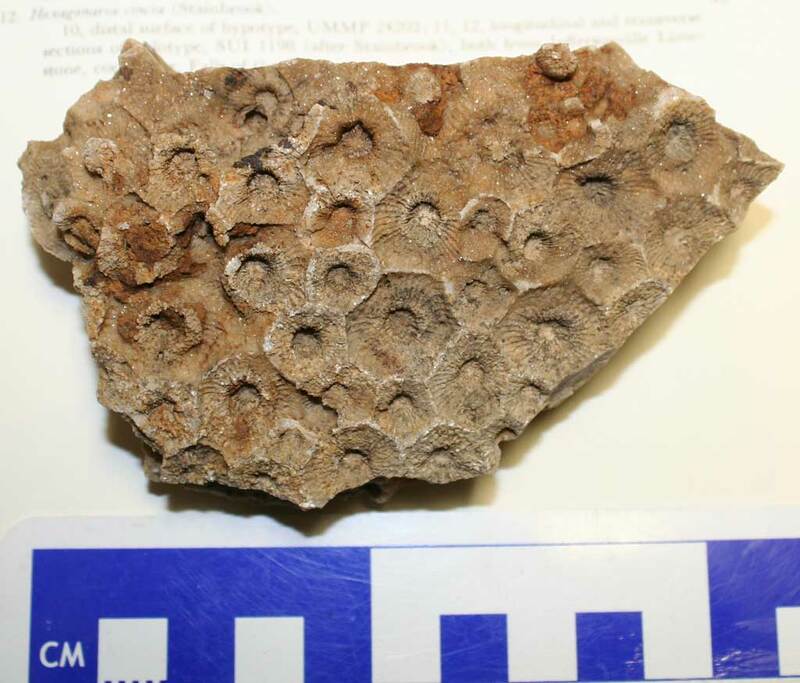 The Cincinnati Fossils book edited by R.A. Davis (Cincinnati Museum Center,1998) lists two species of this bryozoan that are found: Constellaria florida and C. polystomella. My blog title refers to the Frank Sinatra song Fly Me to the Moon "and let me play among the stars". 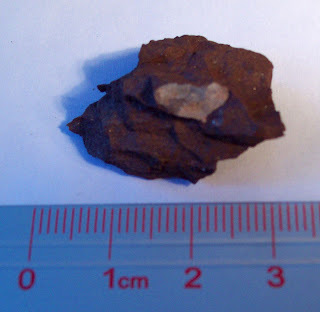 A while back my friend Herb gave me a piece of matrix from Red Hill roadcut in Clinton County, Pennsylvania, USA. 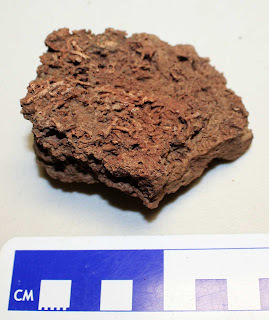 After leaving the sample outside for weeks it began to break apart. In one of the pieces, I found this impression. 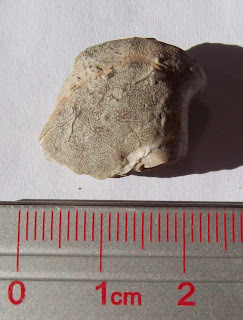 It looks to me to be some sort of brachiopod with radial lines (costae or plicae) and a light blue layer with maybe muscle scars on it. 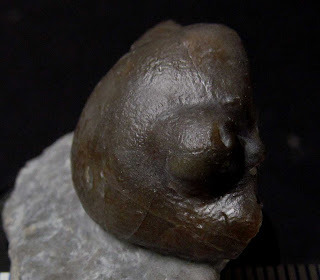 If it is a brachiopod it is very compressed. 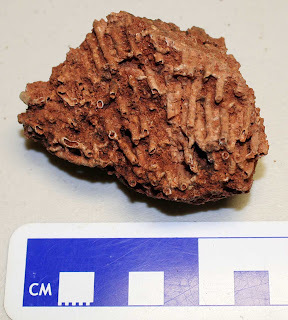 Looking for more information about Red Hill locality (Duncannon Member, Catskill Formation), I consulted the Devonian Times web site. 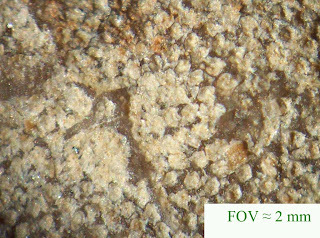 It lists the site as a Late Devonian area (Famennian Stage, 361 million years old). 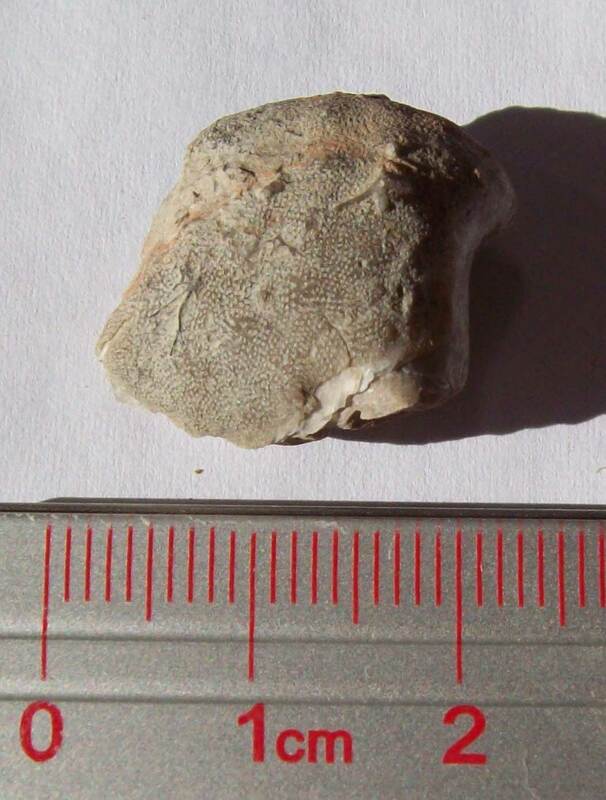 The area was an area that flooded due to a near by river. 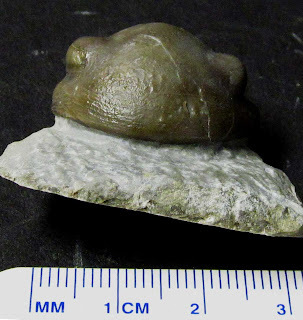 If this was a river, I am not sure about this fossil since I thought brachiopods were marine creatures.